Official artwork of Saki Amamiya from Sin & Punishment. Saki Amamiya (サキ・アマミヤ, Saki Amamiya) is the main character from the game Sin and Punishment: Successor of the Earth. His main weapon of attack is the Dolphin Gun, a gun/beam-sword hybrid which he uses to slash and shoot with. Saki shoots at enemies in Sin and Punishment. Saki Amamiya made his first appearance in Sin and Punishment: Successor of the Earth. Alongside his companions Airan Jo and Achi, Saki is a member of the "Savior Group" that intends to take down a government agency in Japan called the "Armed Volunteers"; along the way, the group also has to protect civilians from the "Ruffians", a species of creatures that mutated from an genetically-modified alternative food source. Throughout the game, Saki's weapon of choice, as well as Airan's, is the Dolphin Gun. In addition to acting as a long-range firearm that can potentially lock onto enemies, Saki can also use the Dolphin Gun to form an energy weapon that can slash enemies not unlike a sword. Through proper use of the weapon, he can also nullify some enemies projectiles. Saki himself is also physically fit, and is able to do flips and rolls while avoiding enemy fire. Of particular note is that while Sin and Punishment was a Japan-only release, it featured voice acting that was fully in English, despite all of the text in the game being in Japanese. Brawl retains this by having Saki speak in English. Saki as he appears in Super Smash Bros. Brawl. Upon appearing on stage, Saki uses his Dolphin Gun (Erroneously called "Cannon Sword" according to the website) to attack opponents. 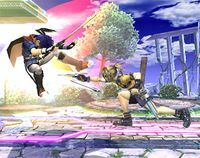 Depending on their location relative to him, Saki will either shoot straight ahead of him, or slash with his weapon in order to inflict damage; the shots have relatively little knockback and easily combo into each other, while the sword packs more knockback and can potentially KO at high percentages. As to reference his agility in his source game, Saki is able to quickly run and jump all over the stage that he has been summoned on; while doing so, he can shoot his weapon while jumping, as well as immediately end his dashing to slash with his weapon some more. The Saki trophy from Brawl. A member of a rescue group that hunts aliens known as Ruffians that prey on mankind. He's killed by Ruffians, but the advance scout Achi resuscitates him, and he gains remarkable physical prowess and becomes the hunt leader. During a battle, he transforms into a Ruffian, and his companion Airan helps him recover. He's optimistic and copes well with danger. Saki as he appears in Super Smash Bros. for Wii U.
Saki returns as an Assist Trophy, only this time he can be defeated. In addition, his collectable trophy is a Challenge reward, obtained by clearing All-Star Mode on hard difficulty with every playable character. The Saki trophy from for Wii U. The Saki trophy from for 3DS. The main character of Sin and Punishment, he is often mistaken for a girl because of his...interesting...hairstyle. Resurrected by the blood of Achi, he has gained superhuman powers. When summoned, he'll target the closest opponents and unleash his powerful gunsword. Sin and Punishment's hero is often mistaken for a girl due to his...well, his girly features. When he was revived by Achi's blood, he gained superhuman fighting skills. In this game, he'll slash and shoot at the nearest target with the Dolphin Gun, a gun/beam-sword hybrid. Saki set for the Mii Gunner. Saki Amamiya does not reprise his role as an Assist Trophy in Super Smash Bros. Ultimate and instead appears as both the basis of a Mii Costume and as a Spirit. The Outfit is exclusive to the Mii Gunner Class while the Headgear is available for all 3 Mii Fighter classes. Challenge board unlock image from for Wii U.
Saki is one of 5 Assist Trophies to have appeared since Brawl, but absent in Ultimate. This page was last edited on April 9, 2019, at 16:35.